How would you like to shape and take part in a conference where the main activity is to explore by listening, talking and questioning (conversing) rather than listen to, and give, prepared lectures; and where the aim is to move forward, taking next steps as a result of these conversations, rather than reporting on the already discovered? In other words, go to a conference where the intention is to move forward by conferring. That is the central feature of our conference a conference of conversation, of listening, talking, and questioning. Of open minds, and delight in the un-thought-of. And what better way to make an interesting conversation than to bring together people whose backgrounds and interests are different, yet who want to learn by listening to others, to find what can be shared? In other words, to transcend boundaries. So we bring together practitioners and theorists who wish to explore across boundaries, from 4 different subjects (domains). But not just any 4 subjects. 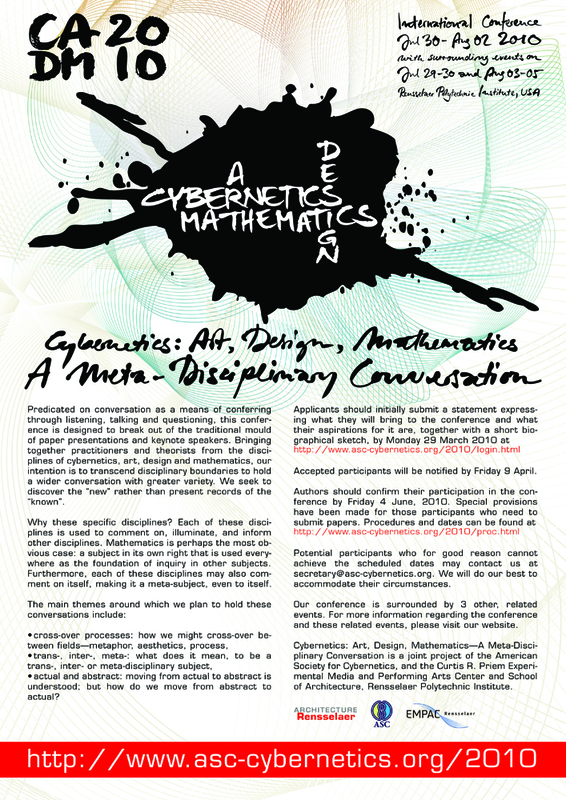 Subjects that already hold conversations together in pairs: art; cybernetics; design; mathematics. With all 4 together, we have a wider conversation, greater variety. Our 4 subjects have a special quality in common. Each is used to comment, throw light on and inform other subjects. Perhaps mathematics is the most obvious case: a subject in its own right that is used everywhere to illuminate (and make operable) other subjects. But also a subject that can comment on itself: a subject which is a meta-subject, even to itself. Our conference is surrounded by 3 other, related events. Look on the web site, chose what you like, and come and join us at The Curtis R. Priem Experimental Media and Performing Arts Center at Rensselaer Polytechnic Institute in Troy, New York, from the evening of July 30 to late afternoon on August 2, with surrounding events on July 29 and 30, and August 3 to 5. Participants will undoubtedly hold individual positions in regard to these four subjects cybernetics, art, design and mathematics. The conference will give individuals ample opportunity to voice their views and corresponding opportunity to listen and converse with others. By releasing the boundaries of prepared lectures, we provide the opportunity for a true appreciation of this unity in diversity.